Let us make it stress free for you. 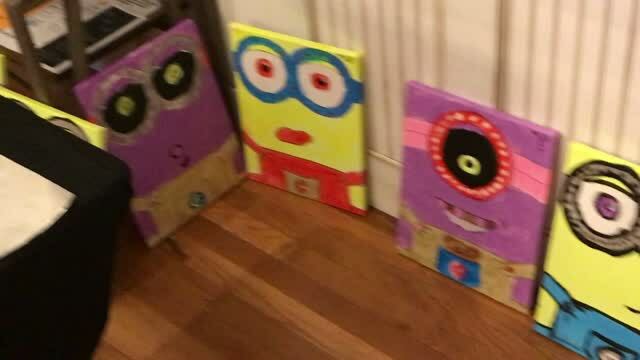 Children's Birthday Parties at $25.00 per child for 11x14 painting. We furnish the pre-drawn canvas, paint, aprons, brushes and Artist. You may bring pizza, snacks, cakes, drinks, etc. Parties are for 2.5 hours; 2 hours to paint and 1/2 hour to open presents and eat. We do all the clean up!!! You may bring Coffee, Tea, Soft drinks and we provide water. Just check our calendar on facebook and see what we are painting. Everyone paints the same picture, we are unique that you pick your colors, your imagination, its your creation. Matt doesn't tell you what colors to use, you can get as creative as you want or what fits your home decor. Matt paints right along with you giving you techniques for you to use in the future. The best part is that, Matt pre-sketches most of all the parties we do. You may bring your beverage of choice, snacks, finger foods, etc.,we provide water. Just check our calendar on Facebook to see if your date is available. Everyone paints the same picture, but you get to pick your picture. We are unique that you pick your colors, your imagination, its your creation. Pot Luck Once Per month. Which means you can paint anything we offer in the studio except on wood or the "Red" truck. Matt is not able to give a lot of instruction but will paint along on a painting to give you some details. This also gives him a chance to walk around and help some, but the creation is all yours.